While it's not seen as desirable to wear your heart on your sleeve, expressing yourself through your T-Shirt, your jumper or your bag is a different story altogether. With a Spreadshirt voucher code you can get great deals on over 180 products printed with a design of your choice – or get creative and upload your own. Whether you're after a unique t-shirt or a business opportunity, a Spreadshirt voucher can save you money while you shop. 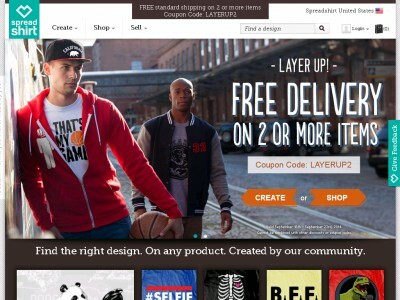 Founded in Leipzig, Germany in 2001, Spreadshirt is a worldwide creative platform for personalised apparel. Starting from humble beginnings, the company has grown in popularity over the years and now boasts offices in Berlin, Paris, Utrecht, Pittsburgh and Boston. The concept is simple: Spreadshirt provides an easy-to-use online platform for both private individuals and commercial organisations to design, buy and sell unique products. At Spreadshirt they produce hundreds of items of clothing and accessories – each of which can be printed with a design of your choice. You can either upload your own design, or choose a product from one of the 400,000 Spreadshirt shops already online. And if you're a designer or artist – or a club, organisation, band or anyone wanting to produce merchandise – you can make money and get your work out there by setting up your own free Spreadshirt shop. Aimed at helping more people develop and wear their own unique fashions, Spreadshirt is a fantastic creative outlet that sees over 30,000 new designs uploaded every week. Spreadshirt is dedicated to providing a premium creative apparel platform that serves both designers, shop owners and customers equally well. For those with their own designs, it's really easy to upload images, create a shop and become part of the community. And for those searching for a limitless source of unique design, shopping at Spreadshirt couldn't be simpler. Just find a design you like, then choose a product to print on – they've got everything from classic t-shirts and hoodies to more unusual items such as aprons, baby bodysuits, umbrellas and iPhone cases. All the items are of the very highest quality, and printed using cutting-edge techniques that ensure a great-looking product that lasts. Want to get shopping with Spreadshirt? With a Spreadshirt voucher code you can shop for unique fashions or create your own designs without spending a fortune. Whether you're an art student looking to supplement your student loan by flogging cool t-shirts to your friends or a band looking for an easy way to create quality merchandise, a Spreadshirt coupon is a great way to save money while you shop. Browse our website until your find a Spreadshirt voucher code that suits you, then navigate to their website to begin shopping. To browse existing designs, click 'Shop'. Click on a product you like for a closer look, then click 'Add to basket' to buy. Enter your Spreadshirt voucher in the box provided and click to redeem. Want to discover more about the internet's favourite creative apparel platform? Why not visit the company's dedicated YouTube channel? You'll enjoy access to lots of exclusive content including product reviews and overviews, design tips, how-to guides and more. You can also use this channel to find out more about saving money with a Spreadshirt coupon. If you enjoy shopping at Spreadshirt, you might also like browsing the latest fashions at Topman or Dorothy Perkins. Or, if those aren't up your street, you'll find plenty more stores in our Fashion, Accessories and Jewellery section. Enter your Spreadshirt voucher code in the box provided and click to redeem. Fill in your details and click 'Continue to payment method'. Select your payment method and enter your payment details. Click 'Review order information' to complete your order. Standard UK delivery is £2.20, with options for Express delivery for a fee. Because of the unique nature of Spreadshirt's custom-design products, the returns procedure varies dependent on the nature of your order. Please refer to the company's full policy. Need to contact the team at Spreadshirt? Whether you have a question about your order, want to know more about setting up a Spreadshirt shop for your own designs or simply want to know how you could save money with a Spreadshirt voucher code, you can contact the Customer Services department by telephoning 020 3137 2587. Want to find out more about what's happening behind the scenes at Spreadshirt? The company maintains a profile across all your favourite social media platforms. Follow them for design inspiration, competitions, style tips and more. You can also use these pages to find out more about saving money with a Spreadshirt discount code. Don’t forget to check them regularly, as you can never be sure when a free Spreadshirt voucher might be waiting for you! Buy now online at www.spreadshirt.com. I love to doodle and draw, but when my friends suggested I sell my designs I didn't know where to start - luckily I found a Spreadshirt voucher code online. It was simple – I just logged on to spreadshirt.co.uk, entered my Spreadshirt voucher and discovered I could upload my designs for printing on a variety of products for a great price. Thanks to my Spreadshirt coupon, I got a great deal on t-shirts and mugs to sell at a craft fair next month. So if you're looking to kickstart a creative business, check out the latest Spreadshirt discount code.